As we look back on our favourite or most influential projects over the past 15 years #MRCNZ15,Luke Chistensen looks at AMETI and bus rapid transit to East Auckland. The eastern area of Auckland has long been associated with traffic congestion and high levels of car use. As the area was being rapidly grown out over the last 20 years, there was very little investment in public transport infrastructure and services. In 2008, MRCagney was asked by the Auckland Regional Transport Authority (ARTA, a predecessor organisation to Auckland Transport) to investigate high quality passenger transport infrastructure and services in East Auckland. This was part of a shift in focus from private vehicles to public transport as a more efficient mode of transport. This built on previous studies which had identified that Panmure to Botany via Ti Rakau Drive and Botany to Manukau City via Te Irirangi Drive were suitable for Bus Rapid Transit. * The Panmure – Botany – Manukau City corridor was suitable for Bus Rapid Transit due to high future patronage demands. * BRT should run in exclusive lanes, but full grade separation was not required. The study suggested the following should be key elements of the busway. 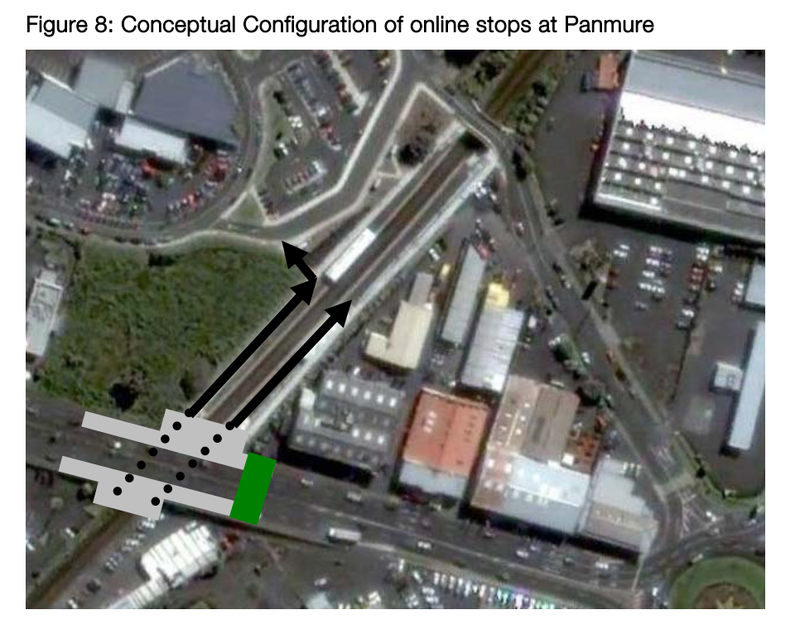 * Bus rail interchange at Panmure, with station on Ellerslie-Panmure Highway above the Panmure station. * High quality stops spaced about every 400 metres along the remainder of the corridor. These elements are all recognisable from the current AMETI scheme. The main design change is that a northside busway is now proposed along the length of the corridor. This comes at a much higher cost, but budgets for public transport have increased significantly since 2008 so this change is welcomed. The Panmure station was implemented as suggested in 2014. Since then rail patronage at Panmure has increased significantly, with annual boardings up from from 210,000 to over 700,000. Panmure is now the fourth busiest station on the network, up from only the thirteenth busiest 5 years ago. The Panmure to Pakuranga section of the busway was given Resource Consent in early 2018, and construction is due to start later this year (https://at.govt.nz/about-us/news-events/designation-approved-for-next-stage-of-ameti-eastern-busway/). 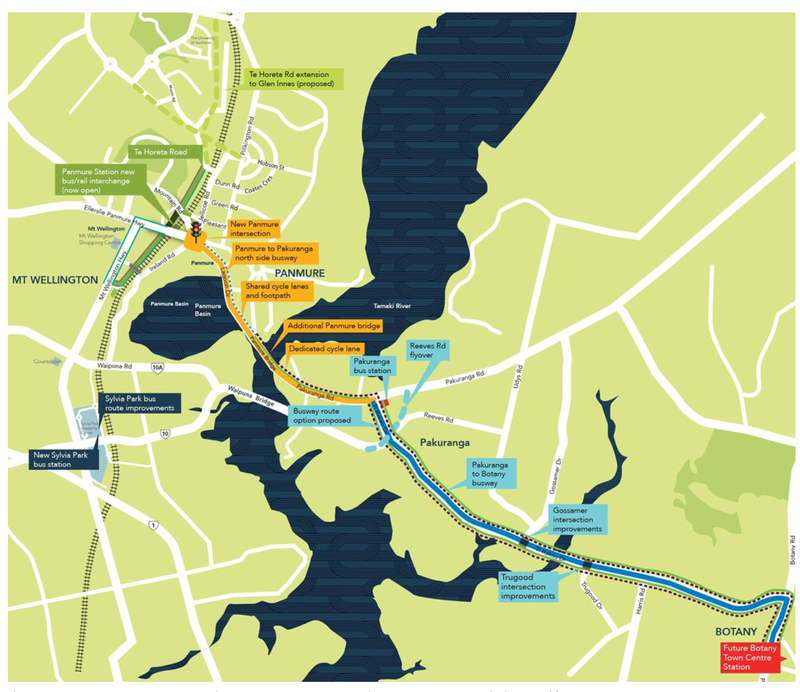 The full length of the busway to Botany is now funded, and expected to be completed by 2026. MRCagney is proud to be associated with major Rapid Transit projects like the AMETI busway, which will transform the quality of public transport in East Auckland. We are really excited about completion of the full busway.